It didn't matter that we were driving down a road with oncoming traffic and cars behind ours. and this was a photographic moment. Do you have someone in your life that notices when the mileage its about to roll over? Do they pause to document the count and pat the dash board like it was a good faithful friend? That was the Howells last week. 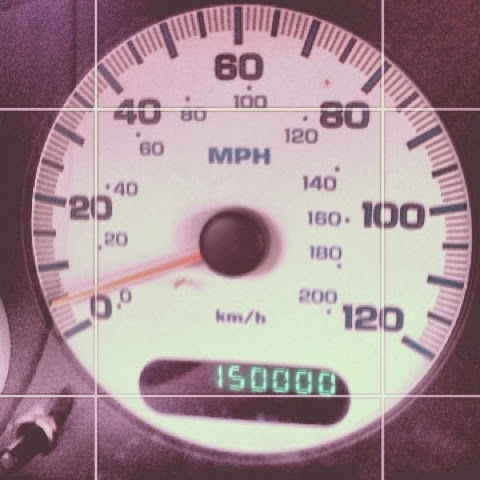 "Guys, we are a bout to hit 150,000 miles." He slowed down so it wouldn't roll past in order for me to snap a pic. It gets us where we want to be. On each of our journeys to get somewhere, our van was also loaded down with baggage. Suitcases crammed in the back to fit like a puzzle. The backpacks of four kids tuck in between long legs. Art supplies that start out in nice packaging are soon littered all over the van floor like confetti. to start a healthy sized bonfire. When I think back over the life of our family, we have put some major mileage in together. We have traveled down the roads of disappointment and fear of the unknown. "The revelation of God is whole and pulls our lives together. The signposts of God are clear and point out the right road." We have also found crazy amounts of joy in building community in a few states. We have witnessed creation at its finest but there is no measure you can put on time together and growing relationships. They by far have been the beauty along our journey. "The life-maps of God are right, showing the way to joy. The directions of God are plain and easy on the eyes." We have hit pot holes and suffered had flat tires. In those moments we couldn't see how the set backs would eventually become a memory and give us hope for what was ahead. and those miles build confidence in our faithful God. Usually, with mileage we have baggage. Its just part of travel. that are not helping us get to that next place of seeing God. We need people in our lives who will travel with us. We long for someone to take notice of the mileage and help us unload some baggage. and keep our eyes up on the destination.